This past Monday night was so hot in Studio City the chickens were laying hard-boiled eggs. Okay, not exactly, but the temperature was definitely cranked up thanks to Howlin’ Ray’s Hot Chicken pop-up at Barrel & Ashes. Chef Johnny Ray Zone (La Poubelle, Bouchon), with an assist from Barrel & Ashes chef de cuisine Mike Kahikina, brought Nashville-style hot chicken to Los Angeles on Monday night. The two chefs are connected from their Bouchon Beverly Hills days when they helped open the Thomas Keller bistro. Zone’s burning desire to bring hot chicken to his hometown of L.A. was ignited one year ago by a staging stint at Nashville’s Husk, where a chef introduced him to the regional dish and the culture that surrounds it—his go-to spot for hot chicken in Nashville is the famous Prince’s Hot Chicken Shack (KeKe’s and Pepperfire offer delicious burns too). From a scale of “Southern” (no heat) to “Howlin’” (fired up with ghost pepper extract, rumor has it), the hot-end of the spectrum turned our mild SoCal weather into a humid, steamy Tennessee summer with one bite. 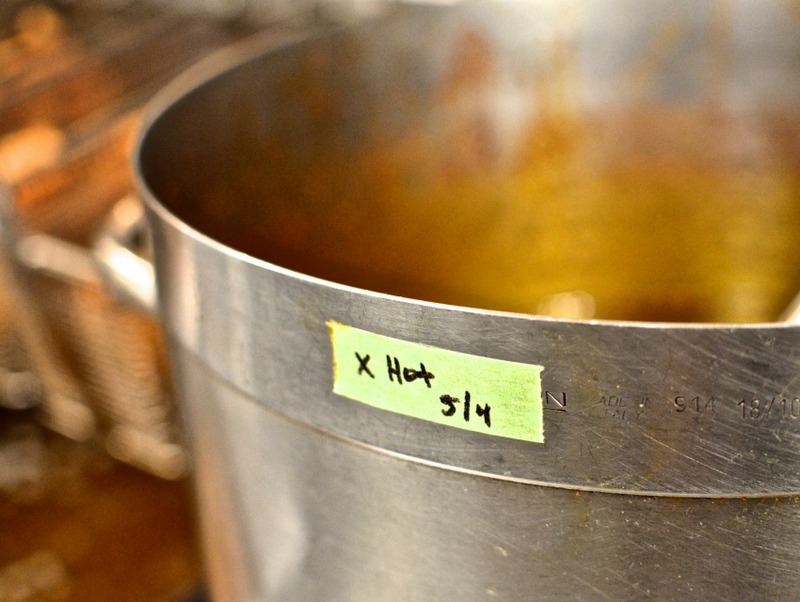 Sweaty foreheads and many tears were witnessed as the top-secret sauce inspired crazy capsaicin pain—about 30 Howlin’ level plates went out that night. 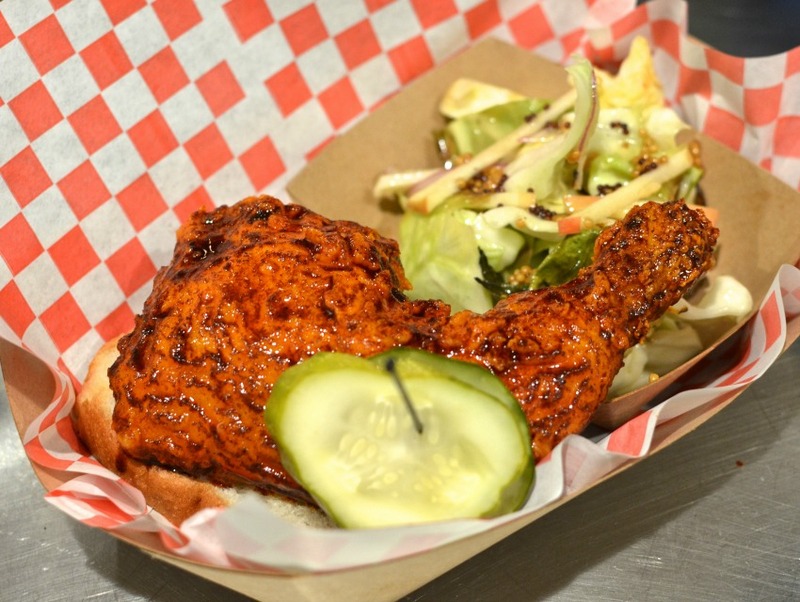 But Howlin’ Ray’s hot chicken isn’t just about heat and hurt. It’s about pleasure, too. Chef Zone aimed for a light, crispy crust that would stick to the chicken while holding onto the hot sauce—a dry brine was the trick. The vinegar root of the sauces is evident and lends nicely to the poultry’s deep-fried sheath. Per Nashville tradition, the piece of chicken roosts atop an un-toasted slice of white bread, which, in this case, came from Puritan Bakery in L.A. Furthering the authenticity are pickle chips—Zone uses thickly cut, sustainable pickles from County Fair Farms in Stockton while the birds are sourced from Mary’s Organic Free-Range Family Farm. Not that you need feel-good reasons to indulge in this very satisfying hot chicken, but it doesn’t hurt, at least, not like the Howlin’ sauce. Zone is also big on fermenting. When he indulges in Korean barbecue, it’s not the meat he wants, but the fermented sides, like kimchi, radishes, and other banchan that tickle his fancy. A side of pickles includes his fermented turnips. Missed out on this rare taste of Nashville cuisine? Don’t start howlin’ yet. You’ll have more chances with another pop-up near the end of May with Hattie B’s chef de cuisine Bron Lindsey. And then, sometime in June is when the Howlin’ Ray’s food truck officially rolls out, roaming the streets of L.A. with Nashville hot chicken and Southern sides to make you howl, hurt, and sweat, then beg for more. Keep track of Howlin’ Ray’s on their website.